Gotham Greens 75,000-square-foot greenhouse atop Method's soap factory in Pullman could produce 40 jobs and up to a million pounds of produce per year. PULLMAN — Vacant land where railroad mogul George Pullman built palace cars and Joseph Ryerson’s company later fabricated steel soon will be home to new industry that's environmentally friendly and literally green. 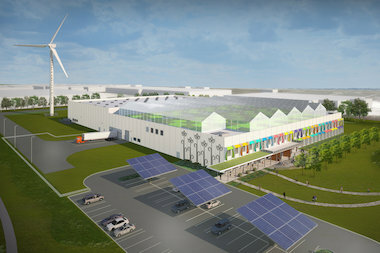 Eco-friendly cleaning products maker, Method Products, plan to top their new Pullman soap factory — which will be partially powered by solar and wind energy — with the “worlds largest rooftop farm,” a 75,000-square-foot greenhouse run by Gotham Greens. By this spring, the rooftop farm — Gotham Green’s first outside New York City — is expected to hire 40 workers and begin growing up to 1 million pounds of vegetables and leafy greens per year that the company expects to harvest and package the same day it’s sold at local farmers markets and stores. In New York City, Gotham Greens specializes in hydroponically grown gourmet leafy lettuce, herbs and tomatoes, including butterhead lettuce, bok choy, arugula, Swiss chard and a variety of cherry tomatoes. "This is an exciting opportunity to bring fresh, healthy produce year-round to Pullman, which is underserved for food, and going through an exciting resurgence in economic development,” Gotham Greens CEO Viraj Puri said. The dual-use factory project is the latest part of a slow-but-steady interest in the Pullman Park site near 111th and the Bishop Ford Freeway, which is anchored by WalMart. Method, which sells its cleaning products at Target and Lowes, could start making soap at the Pullman factory in January. Last month, Method installed an on-site windmill and solar panels that will produce about half the soap plant’s energy needs. Recently, construction started on an Advocate health center and urgent care in the strip mall parking lot. “There will be doctors offices and outpatient care that’s really needed in the community,” said project developer David Doig, president of Community Neighborhood Initiatives. On Tuesday, Doig was at the Chicago Deal Making Conference at Navy Pier courting restaurants that he hopes to lure to Pullman Park. “Development is incremental, but we’re trying to line up other tenants and get some restaurants here,” Doig said.